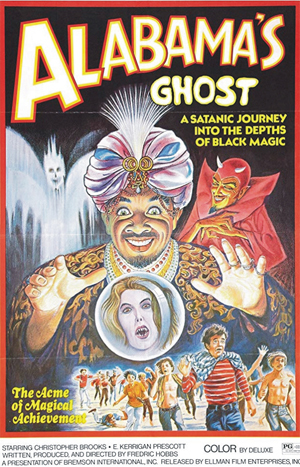 ALABAMA’S GHOST (1973) Christopher Brooks, Peggy Browne, E. Kerrigan Prescott, Steven Kent Browne, Ken Grantham. You’ve probably never seen anything quite like Alabama’s Ghost. A nightclub stage manager stumbles upon a forgotten, secret chamber underneath his nightclub. Inside is an old magician's belongings. He tries on the costume and…voila…he becomes "Alabama, King of the Cosmos." His new identity leads to a lot more than he bargained for. This ultra-obscurity features voodoo, ghosts, vampires, robots, magicians, hippies, rock concerts, and more. A totally bizarre Z-film classic. Color, from 16mm.